Essentially, pervious concrete is a structural concrete pavement with a large volume (15 to 35 percent) of interconnected voids. Like conventional concrete, its made from a mixture of cement, coarse aggregates, and water. However, it contains little or no sand, which results in a porous open-cell structure that water passes through readily. Close-up of a pervious pavement at Splashpad Park, Oakland, Calif. The network of voids gives the concrete its characteristic honeycomb texture. 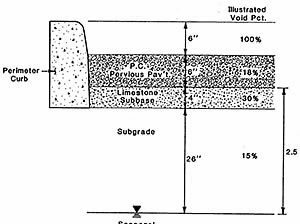 Schematic of a typical pervious concrete pavement section. When pervious concrete is used for paving, it can take in stormwater at a rapid rate of 3 to 5 gallons per minute per square foot of surface area, which exceeds the flow rate needed to prevent runoff in most rain events. The rainwater may be stored in a coarse gravel layer underneath the pavement or allowed to percolate into the underlying soil. Because the pavement itself acts as a retention area, it helps to prevent much of the polluted runoff that normally occurs with impervious pavements. The filtration process also helps to purify the water. As the water percolates through the open cells of the pavement, aerobic bacteria in the voids help to break down harmful pollutants and chemicals. Tree roots need air as well as water. Pervious concrete allows the passage of both. 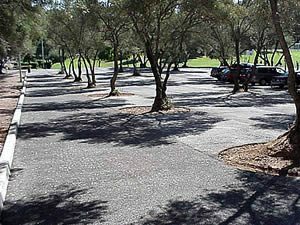 This pervious parking lot at Miller Park in Fair Oaks, Calif., is helping to preserve over 23 mature olive trees through natural irrigation. The lush tree canopy also shades the parking lot to provide natural cooling. Stormwater runoff is a leading source of the pollutants entering our waterways. According to the U.S. Environmental Protection Agency, about 90 percent of surface pollutants are carried by the first 1-1/2 inch of rainfall. Stormwater drains don't typically channel this polluted runoff to treatment facilities, but instead convey it directly into local water bodies. This can increase algae content, harm aquatic life, and require expensive treatments to make the water potable. According to Youngs, the big three pollutants in urban runoff are sediment (dirt and debris), heavy metals (from the brake linings of cars), and hydrocarbons. One source of hydrocarbons is the oil that drips onto pavements from vehicles. But the primary contributor is asphalt. Studies have shown that 90 to 95 percent of the hydrocarbons in urban runoff is from the binder and sealer used for asphalt pavements, he says. To address these serious pollution concerns, the EPA and many local municipalities and regional watershed authorities are tightening environmental regulations and requiring more stringent stormwater management practices. Pervious concrete is becoming one of the most viable solutions. Reduce the amount of untreated runoff discharging into storm sewers. Directly recharge groundwater to maintain aquifer levels. Channel more water to tree roots and landscaping, so there is less need for irrigation. Mitigate pollutants that can contaminate watersheds and harm sensitive ecosystems. Eliminate hydrocarbon pollution from asphalt pavements and sealers. In addition to stormwater control, pervious concrete pavements aid in reducing the urban heat-island effect. Because they are light in color and have an open-cell structure, pervious concrete pavements don't absorb and store heat and then radiate it back into the environment like a typical asphalt surface. The open void structure of the pervious pavement also allows cooler earth temperatures from below to cool the pavement. The lighter color of concrete is also beneficial from an energy-savings standpoint. Because the concrete is reflective, the need for lighting at night is reduced. Beyond helping the environment, pervious concrete pavements are also safer for drivers and pedestrians. 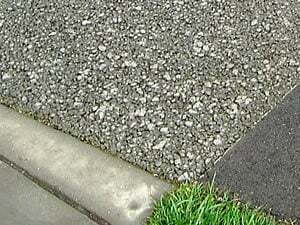 Because pervious concrete absorbs water rather than allowing it to puddle, it reduces hydroplaning and tire spray. In California, parks are installing pervious concrete pathways to provide disability access for people in wheelchairs. Progressive Hardscapes (PCW) is based in Arizona and has over 50 years of experience in the industry. Progressive's employees are extensively trained in pervious concrete installation and certified by the NRMCA (National Ready Mix Association), making them a leader in pervious concrete. Experience and training are vital when it comes to pervious concrete because the concrete is poured with a slump of zero and a low water-to-cement ratio. PCW also has experience pouring large scale jobs such as the one featured in the video. This project consisted of removing 10,000 sq ft of asphalt for Arizona State University and replacing it with pervious concrete.